The ever reliable master, Denzel Washington, commits to his first ever sequel; a slightly flabby and predictable, but also satisfyingly brutal vendetta affair. Sure, it's a shame that Washington didn't make a sequel to Man on Fire instead (the film was based on one of a whole series of novels about the excellent character of Creasy), but The Equalizer 2 - at least in its uncut 18-rated home format edition (exclusive to the 4K release, mind you) - affords something of a consolation prize, giving the legendary actor his first taste at a potential franchise, courtesy of returning director Antoine Fuqua, also making his debut sequel. Fuqua and Washington have their routine nailed down by now, having worked together almost as much as the star worked with the late Tony Scott, and similarly lapsing slightly into the realm of comfortability, churning out a remake of The Magnificent Seven that was not only unnecessary but also - arguably even more unforgivably - utterly uninspired. Whilst The Equalizer was hardly a critically and commercially celebrated feature, it was still a satisfyingly brutal (albeit still lite) variation on Washington's earlier Man on Fire, reinventing its 80s TV series foundation as a hyper-stylish actioner, primed and ready for the powerhouse actor to efficiently break heads in. It may not have been crying out for a sequel, but we got one nonetheless. Washington barely breaks a sweat, stylishly putting people out of his misery, killing his way to what could be the master actor's first ever franchise. Picking up where the last 'origin story' left off, Washington's ex-intelligence operative now turned Uber driver is finally in full business as a secret gun for hire, prepared to help the weak find justice against all odds. It gives him some peace, but when an old friend gets into trouble, he finds himself caught up in his old spy games, facing assassins and unlikely betrayals in his bloody quest for the truth - and justice. At times languid in its plotting - an entire sub-plot involving the father-son-esque mentoring of a local youth appears merely in place to fill the void of the Chloe Grace Moretz character from the first film - The Equalizer 2's biggest flaw is predictability, with a paint-by-numbers plot that really could have done with a little more suspense. Ultimately, Washington just about wins out supreme though, still delivering the goods at 63; breaking heads and booming words, whilst Fuqua maintains a slick familiarity to his slightly lazier style this time out - Equalizer-vision(TM) appears utterly pointless this time out - building towards an interesting and atypically spectacular finale (at least in terms of setting) that's only let down by a weak, one-dimensional, and utterly see-them-coming-a-mile-away, villain. Washington + violent deaths prove the saving grace; he barely breaks a sweat, stylishly putting people out of his misery, killing his way to what could be the master actor's first ever bona fide franchise. 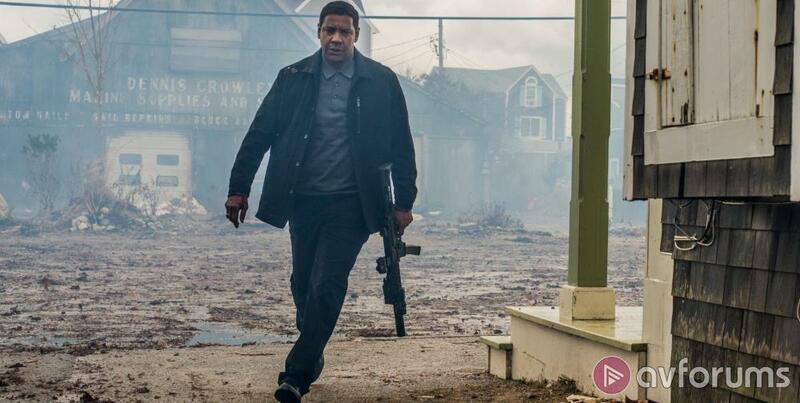 The Equalizer 2 was shot digitally at resolutions of 2.8K, but is likely capped by a 2K Digital Intermediate much like the first film, leaving this Ultra HD Blu-ray release an upscale. Nonetheless, on true form, Sony don't disappoint in delivering the goods. The disc presents a native 3840 x 2160p resolution image in the film's original theatrical aspect ratio of widescreen 2.4:1. It uses 10-bit video depth, a Wide Colour Gamut (WCG) and High Dynamic Range (HDR), and is encoded using the HEVC (H.265) codec. We reviewed the UK Ultra HD Blu-ray release of The Equalizer 2 on an LG 55B7 Dolby Vision 4K Ultra HD OLED TV with an LG UP970 Dolby Vision 4K Ultra HD Blu-ray player. As perhaps you'd only expect from Sony, this is a great looking video presentation - upscale or not. Shot with the same moody, dark and stylised look as the first film, the sequel gets off to a cracking start with its James Bond-esque pre-credits-style sequence, enjoying detailing of rich interiors, ornate glasses, wisps of fake beard and bloody wounds. The upscale still manages to squeeze more clarity out of the image (which, in a few places, is surprisingly soft - even lapsing in focus once or twice, one can only assume 'intentionally' as it's not a fault of the presentation) and there are some absolutely stunning shots, often courtesy of a camera strapped to the side of a moving vehicle, enjoying crystal clear reflections in the windows and panelling. The colour scheme benefits from keen but nuanced HDR and WCG implementation, with not a neon pop in sight, and instead richer and deeper tones that gain in textured layering, and supreme black levels that allow a nice increase in shadow detail to help further distinguish the presentation from that afforded by its Blu-ray counterpart. As perhaps you'd only expect from Sony, this is a great looking video presentation - upscale or not. As with the first film's 4K bow - which wasn't actually that long ago - the film boasts a hell of an aural upgrade as well, with the 4K release going full throttle with a boisterous Dolby Atmos track, founded upon an already reference Dolby TrueHD 7.1 core which offers up excellent coverage on the key elements of dialogue, effects and score, that last element providing the same now-signature theme that happily reminds us that this is a follow-up tale. Dialogue remains keenly represented across the proceedings, with Washington's quietly threatening - and, when necessary, beamingly powerhouse - vocals clearly and coherently disseminated across the frontal array. Effects allow for all the nuances of the production - elevator noises, screeching car tyres, deafening explosions and booming munitions aplenty. Each gunshot permeates your every pore, punching holes in your living room, afforded a nice little LFE rumble, whilst the score draws you back into the fray; a great little signature for Washington's justice-giver, and a fabulous close to a tremendous track. The Equalizer 2 delivers the goods on the extras front too, albeit only on the accompanying Blu-ray, affording the sequel a suitably titled "Retribution Mode", which is the 4K version of a good old PiP track, with Washington and Fuqua offering a fun video commentary exploring the production of what amounts to a first sequel for both of them. There's also a fun little pop-up Trivia Track for more on-screen, in-movie entertainment. The Equalizer 2 delivers the goods on the extras front too. There's 11 Deleted and Extended Scenes, which are worth dipping into, although the film could arguably have done with being a little shorter rather than longer, and a slew of Featurettes including an overview of Washington's 'Round 2' as McCall, a look at Fuqua's directorial flair, a breakdown of the action and a couple of Promos. Although not as good as the first one, fans of that film should still check it out. Washington's first sequel is perhaps not the first choice many fans would have asked for (*cough*Man on Fire) but that doesn't stop the master actor from delivering his utmost to this somewhat formulaic but thankfully still brutally satisfying follow-up. It was never going to be Flight, but the man's slick Hollywood sheen output with Fuqua has always proven entertaining even if utterly derivative (c.f. The Magnificent Seven). Sony's 4K Blu-ray release is tremendous, with excellent video and audio, and a strong salvo of additional features (on the accompanying Blu-ray), rounding out a great package for fans to pick up. Although not as good as the first one, fans of that film should still check it out. Write your The Equalizer 2 UHD Blu-ray review.